How you plan to use your LED sign will affect the size, resolution and model that’s right for your location. Will your sign be seen by fast-moving highway traffic from a long distance or at close range by a mixture of pedestrian and vehicle traffic? What kind of content do you plan to display? Do you plan to use still images or animation, or both? Is a double-sided or single-sided sign structure needed, or will the digital sign be mounted to a wall? Technical factors like viewing distance, traffic speed, space restrictions and zoning constraints also affect this decision. Replacing a manual reader board or retrofitting an existing sign plays a role in installation considerations. The sign experts with your local sign company can help analyze each of these factors to help you select the right sign for your location. The pixel pitch is effectively the resolution of the sign. The tighter the pitch, the higher the resolution. 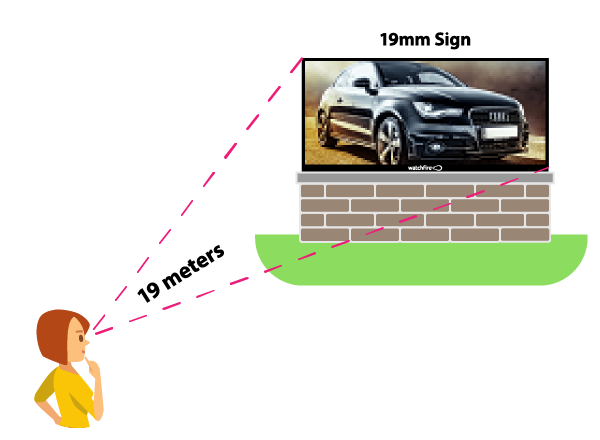 Our 8mm & 10mm high resolution models are best for close viewing, while the wide pixel pitches in our 16mm & 19mm are meant for signs higher from the ground and farther from traffic. A quick way to estimate the viewing distance is to change the pixel pitch, in millimeters, to meters for an estimate of the viewing distance needed. To determine the appropriate size for your location, take into consideration the speed and type of traffic, distance from the roadway, space restrictions, zoning constraints and desired sign content. Watchfire XVS models offer full motion video (up to 60 frames per second) and whole-sign color calibration for the truest, most lifelike images. If you will use your sign to display video content, you’ll want to be sure to select a sign with a width-to-height, or “aspect ratio”, that closely matches the format of the video content. Take some time to think about how you will use your sign, because sign size and resolution can impact the type of message content you’ll be able to display. Smaller signs are best suited for text and simple logos, while larger sign sizes have more flexibility displaying a variety of layouts like logos, text and product images. Detailed product images will be best represented on a high resolution sign. Our patented multi-channel data configuration, available on most XVS signs, ensures that if an issue with a Watchfire LED sign ever occurs, it will be isolated to a single module and messages will still be readable. Without multi-channel data, one data connection error could affect all the modules in a row, leaving the sign unreadable. As with most big purchases, quality, features and size will all affect the price of your LED sign. It’s important to remember that an LED sign should not be viewed as a capital investment. Instead, look to your marketing and advertising budgets. Unlike traditional advertising methods, LED signs offer incredible value and ongoing return on investment. 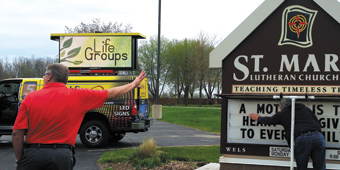 Consider this: when you invest in an LED sign, you control the “publication” of your message. You won’t lose time and money getting an ad into circulation. Instead, your advertising will reach people when they’re most able to act on it. We’ve seen business owners sacrifice quality for price and purchase an inferior, imported product only to have it replaced a few months later. A low price can be enticing, but your initial savings may cost a lot more than you bargained for. The fact is your investment in an LED sign is just too large to gamble your success on a cut-rate product. Digital displays have evolved over the last decade to provide better graphics, more colors, better software, and they have become more energy efficient. Upgrading to a newer LED sign can save you money and give you access to new innovative features. Watch our video to see how an upgrade can reduce your energy consumption. Even if you have an older LED sign, upgrading brings the benefit of higher resolution, more flexible software and enhanced diagnostic reporting. Try before you buy. Let us connect you with a Watchfire representative for an on-site demonstration.